Welcome to the PayPal Credit Promotion Portal. 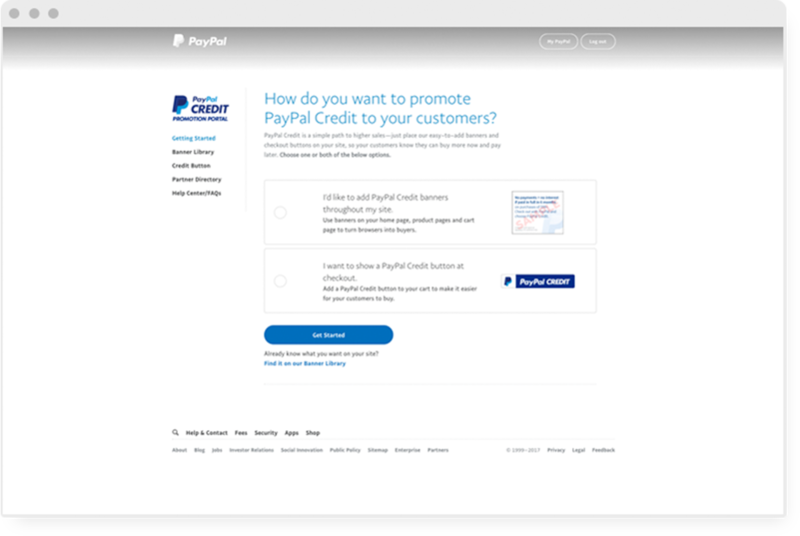 Log in now to access the PayPal Credit Promotion Portal, or learn more about the benefits of offering financing to your customers. When shoppers can buy now and pay over time, they spend more. Give your customers greater buying power with PayPal Credit financing. *Study commissioned by PayPal and conducted by comScore Research. comScore online panel of 1 million desktop users in the US during Q3 2015. **As reported in Neilsen’s PayPal Credit Average Order Value Study for activity occurring from April 2015 to March 2016 (small merchants) and October 2015 to March 2016 (midsize merchants), which compared PayPal Credit transactions to credit and debit card transactions on websites that offer PayPal Credit as a payment option or within the PayPal Wallet. Nielsen measured 284890 transactions across 27 mid and small merchants. Copyright Nielsen 2016.